Yesterday Ten Days on the Island and Hobart City Council officially announced at a formal event, their partnership to bring Digital Odyssey to Hobart next year as part of Ten Days on the Island, Tasmania’s premier cultural event. This is an excellent outcome for Digital Odyssey, and a fantastic addition to the Ten Days program in the beautiful city of Hobart. Craig will be in residency in Hobart from 28 February – 3 April 2011, working with the local community and presenting public programs and projection artworks responsive to the town and its stories. 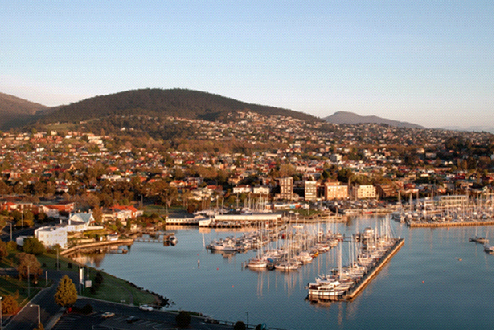 Congratulations to Ten Days and the Hobart City Council on yesterday’s announcement and launch – the MCA looks forward to working with our partners in Tasmania on Digital Odyssey early next year! Splendour in the Grass 2010 to host Digital Odyssey! The Digital Odyssey team is super excited to announce that Splendour in the Grass 2010 is set to host Digital Odyssey at this year’s festival at Woodford, Qld 30 July – 1 August 2010. Craig has a long affiliation with Splendour in the Grass and is a member of the Splendid arts initiative Curatorium. Craig will now present artworks at the festival from Digital Odyssey, and will also be there to oversee the display of creative outcomes by this year’s young artists from the Splendid program. For Splendour in the Grass audiences this is an amazing chance to view Craig’s artworks in a unique and unforgettable context, and also provides Splendid artists the professional development opportunity to observe Craig at work. CLICK HERE to check out the excellent article on Craig and the Digital Odyssey touring project, by Ashleigh Wilson for The Australian newspaper. In this blog, artist-in-residence Craig Walsh documents his journey around and across Australia. He is travelling with his partner, artist Hiromi Tango and their daughter Kimyo in the Digital Odyssey motor home, a Coachmen Class A Miranda fitted specifically to the needs of an artist. Kicking off from his departure from Brisbane, the artist’s ongoing diary provides insights into his artistic process, behind-the-scenes stories and no doubt some tales of adventure – a combination of ingredients that contribute towards this Digital Odyssey.